I want to label the window tabs of terminal sessions. 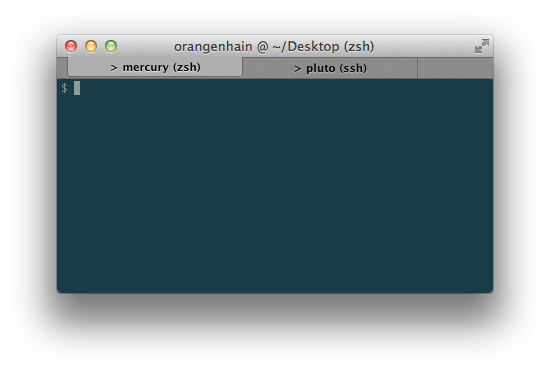 I'm using the zshell in iterm2 on OSX. Is it possible to change the label of a window tab dynamically in the terminal? echo -ne "\e]1;this is the title\a"
If you want to automate that to insert e.g. the current time or working directory, edit your zsh configuration files to set the title in the precmd() function to e.g. $PWD. You can read about the precmd function in man zshmisc in the section SPECIAL FUNCTIONS. echo -e "\033];this is the title\007"
This way you can immediately see what host you're connected to in what window, and the window title for each tab shows user & CWD. A precmd does the trick. 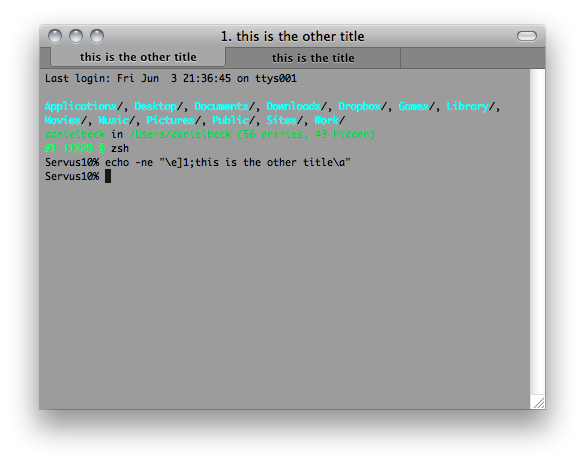 However, some oh-my-zsh themes mess around with the window title. Set PR_TITLEBAR to an empty string to fix it. I would also recommend playing around with the tab settings of iTerm2 in Preferences -> Appearance. Adding export PROMPT_COMMAND='echo -ne "\033]0;$PWD\007"' into ~/.bash_profile worked for me. Not the answer you're looking for? Browse other questions tagged command-line osx-snow-leopard zsh iterm or ask your own question. How to change Terminator title terminal title, ZSH on Debian? How do I set up an AppleScript to open a new iTerm2 tab and change the directory? How do I stop automatic changing of iterm tab titles? Difference between tmux and shell split options on iTerm2? iTerm2 (version 3): Individual history per tab?